Smithson Tennant FRS was an English chemist. In Greek mythology, Iris is the personification and goddess of the rainbow and messenger of the gods. Catalysis is the process of increasing the rate of a chemical reaction by adding a substance known as a catalyst, which is not consumed in the catalyzed reaction and can continue to act repeatedly. Because of this, only very small amounts of catalyst are required to alter the reaction rate in principle. Iridium is found in meteorites in much higher abundance than in the Earth's crust. 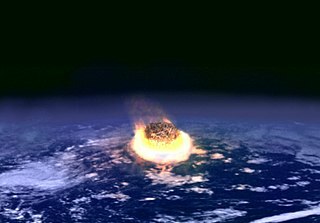 For this reason, the unusually high abundance of iridium in the clay layer at the Cretaceous–Paleogene boundary gave rise to the Alvarez hypothesis that the impact of a massive extraterrestrial object caused the extinction of dinosaurs and many other species 66 million years ago. Similarly, an iridium anomaly in core samples from the Pacific Ocean suggested the Eltanin impact of about 2.5 million years ago. Hardness is a measure of the resistance to localized plastic deformation induced by either mechanical indentation or abrasion. Some materials are harder than others. Macroscopic hardness is generally characterized by strong intermolecular bonds, but the behavior of solid materials under force is complex; therefore, there are different measurements of hardness: scratch hardness, indentation hardness, and rebound hardness. In Munich, Germany in 1957 Rudolf Mössbauer, in what has been called one of the "landmark experiments in twentieth-century physics",  discovered the resonant and recoil-free emission and absorption of gamma rays by atoms in a solid metal sample containing only 191Ir. This phenomenon, known as the Mössbauer effect (which has since been observed for other nuclei, such as 57Fe), and developed as Mössbauer spectroscopy, has made important contributions to research in physics, chemistry, biochemistry, metallurgy, and mineralogy. Mössbauer received the Nobel Prize in Physics in 1961, at the age 32, just three years after he published his discovery. In 1986 Rudolf Mössbauer was honored for his achievements with the Albert Einstein Medal and the Elliot Cresson Medal. Iridium is one of the least abundant elements in Earth's crust. The red arrow points to the Cretaceous–Paleogene boundary. Their resistance to arc erosion makes iridium alloys ideal for electrical contacts for spark plugs,   and iridium-based spark plugs are particularly used in aviation. Iridium is a good catalyst for the decomposition of hydrazine (into hot nitrogen and ammonia), and this is used in practice in low-thrust rocket engines; there are more details in the monopropellant rocket article. Iridium is also used as a coating for non-conductive materials in preparation for observation in scanning electron microscopes (SEM). The addition of a 2-20nm layer of iridium helps especially organic materials survive electron beam damage and reduces static charge build up within the target area of the SEM beam's focal point. A coating of iridium also increases the signal to noise ratio associated with secondary electron emission which is essential to using SEMs for X-Ray spectrographic composition analysis. ↑ Most common oxidation states of iridium are in bold. The right column lists one representative compound for each oxidation state. ↑ Iridium literally means "of rainbows". ↑ The definition of the meter was changed again in 1983. The meter is currently defined as the distance traveled by light in a vacuum during a time interval of ​1⁄299,792,458 of a second. Barium is a chemical element with symbol Ba and atomic number 56. It is the fifth element in group 2 and is a soft, silvery alkaline earth metal. Because of its high chemical reactivity, barium is never found in nature as a free element. Its hydroxide, known in pre-modern times as baryta, does not occur as a mineral, but can be prepared by heating barium carbonate. Meitnerium is a synthetic chemical element with symbol Mt and atomic number 109. It is an extremely radioactive synthetic element. 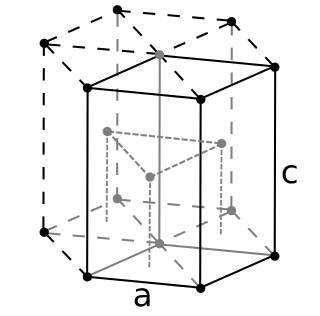 The most stable known isotope, meitnerium-278, has a half-life of 7.6 seconds, although the unconfirmed meitnerium-282 may have a longer half-life of 67 seconds. The GSI Helmholtz Centre for Heavy Ion Research near Darmstadt, Germany, first created this element in 1982. It is named after Lise Meitner. Rhenium is a chemical element with symbol Re and atomic number 75. 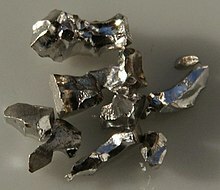 It is a silvery-gray, heavy, third-row transition metal in group 7 of the periodic table. With an estimated average concentration of 1 part per billion (ppb), rhenium is one of the rarest elements in the Earth's crust. 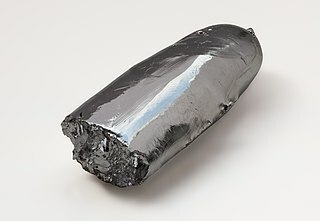 Rhenium has the third-highest melting point and second-highest boiling point of any element at 5903 K. Rhenium resembles manganese and technetium chemically and is mainly obtained as a by-product of the extraction and refinement of molybdenum and copper ores. Rhenium shows in its compounds a wide variety of oxidation states ranging from −1 to +7. Scandium is a chemical element with symbol Sc and atomic number 21. 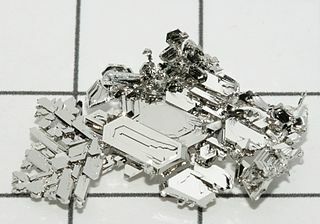 A silvery-white metallic d-block element, it has historically been classified as a rare-earth element, together with yttrium and the lanthanides. It was discovered in 1879 by spectral analysis of the minerals euxenite and gadolinite from Scandinavia. A period 5 element is one of the chemical elements in the fifth row of the periodic table of the elements. The periodic table is laid out in rows to illustrate recurring (periodic) trends in the chemical behaviour of the elements as their atomic number increases: a new row is begun when chemical behaviour begins to repeat, meaning that elements with similar behaviour fall into the same vertical columns. The fifth period contains 18 elements, beginning with rubidium and ending with xenon. 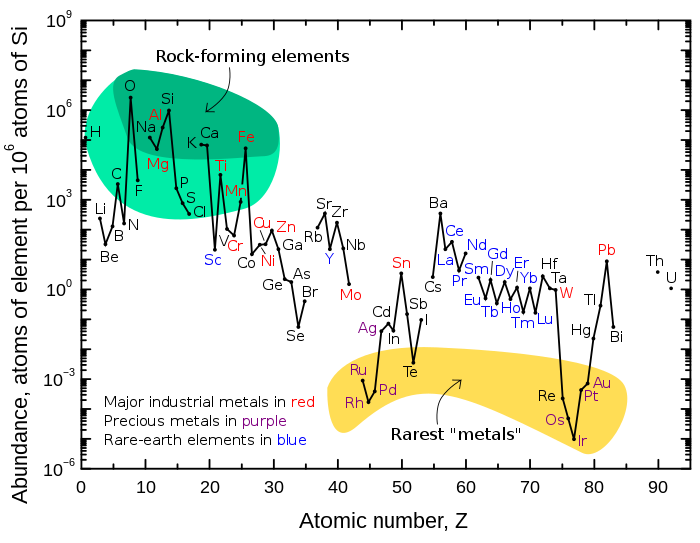 As a rule, period 5 elements fill their 5s shells first, then their 4d, and 5p shells, in that order; however, there are exceptions, such as rhodium. In chemistry, the noble metals are metals that are resistant to corrosion and oxidation in moist air. The short list of chemically noble metals comprises ruthenium (Ru), rhodium (Rh), palladium (Pd), silver (Ag), osmium (Os), iridium (Ir), platinum (Pt), and gold (Au). There are two natural isotopes of iridium (77Ir), and 34 radioisotopes, the most stable radioisotope being 192Ir with a half-life of 73.83 days, and many nuclear isomers, the most stable of which is 192m2Ir with a half-life of 241 years. All other isomers have half-lives under a year, most under a day. Bismuth is a chemical element with symbol Bi and atomic number 83. 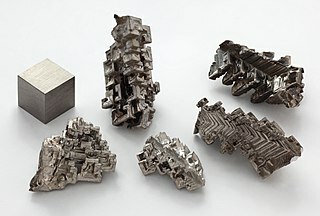 It is a pentavalent post-transition metal and one of the pnictogens with chemical properties resembling its lighter homologs arsenic and antimony. Elemental bismuth may occur naturally, although its sulfide and oxide form important commercial ores. The free element is 86% as dense as lead. 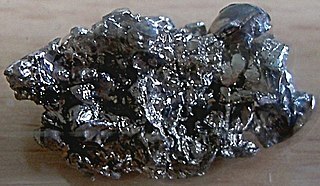 It is a brittle metal with a silvery white color when freshly produced, but surface oxidation can give it a pink tinge. Bismuth is the most naturally diamagnetic element, and has one of the lowest values of thermal conductivity among metals. Cerium is a chemical element with symbol Ce and atomic number 58. Cerium is a soft, ductile and silvery-white metal that tarnishes when exposed to air, and it is soft enough to be cut with a knife. Cerium is the second element in the lanthanide series, and while it often shows the +3 oxidation state characteristic of the series, it also exceptionally has a stable +4 state that does not oxidize water. It is also considered one of the rare-earth elements. Cerium has no biological role and is not very toxic. Disulfur dioxide, dimeric sulfur monoxide or SO dimer is an oxide of sulfur. The solid is unstable with a lifetime of a few seconds at room temperature. 1 2 3 Wang, Guanjun; Zhou, Mingfei; Goettel, James T.; Schrobilgen, Gary G.; Su, Jing; Li, Jun; Schlöder, Tobias; Riedel, Sebastian (2014). "Identification of an iridium-containing compound with a formal oxidation state of IX". Nature. 514: 475–477. Bibcode:2014Natur.514..475W. doi:10.1038/nature13795. PMID 25341786. ↑ Becker, Luann (2002). "Repeated Blows" (PDF). Scientific American. 286 (3): 77–83. Bibcode:2002SciAm.286c..76B. doi:10.1038/scientificamerican0302-76 . Retrieved January 19, 2016. 1 2 3 4 5 6 7 8 9 10 11 12 13 14 Greenwood, N. N.; Earnshaw, A. (1997). Chemistry of the Elements (2nd ed.). Oxford: Butterworth–Heinemann. pp. 1113–1143, 1294. ISBN 978-0-7506-3365-9. OCLC 213025882. 1 2 3 4 5 6 7 8 9 10 11 12 13 14 15 Hunt, L. B. (1987). "A History of Iridium" (PDF). Platinum Metals Review. 31 (1): 32–41. ↑ Kittel, C. (2004). Introduction to Solid state Physics (7th ed.). Wiley-India. ISBN 978-81-265-1045-0. ↑ Cotton, Simon (1997). Chemistry of Precious Metals. Springer-Verlag New York, LLC. p. 78. ISBN 978-0-7514-0413-5. ↑ Lide, D. R. (1990). CRC Handbook of Chemistry and Physics (70th ed.). Boca Raton (FL):CRC Press. ↑ Arblaster, J. W. (1989). "Densities of osmium and iridium: recalculations based upon a review of the latest crystallographic data" (PDF). Platinum Metals Review. 33 (1): 14–16. 1 2 3 4 5 6 7 8 9 10 Emsley, J. (2003). "Iridium". Nature's Building Blocks: An A–Z Guide to the Elements. Oxford, England, UK: Oxford University Press. pp. 201–204. ISBN 978-0-19-850340-8. 1 2 Perry, D. L. (1995). Handbook of Inorganic Compounds. CRC Press. pp. 203–204. ISBN 978-1439814611. ↑ Lagowski, J. J., ed. (2004). Chemistry Foundations and Applications. 2. Thomson Gale. pp. 250–251. ISBN 978-0028657233. ↑ Munson, Ronald A. (February 1968). "The synthesis of iridium disulfide and nickel diarsenide having the pyrite structure" (PDF). Inorganic Chemistry. 7 (2): 389–390. doi:10.1021/ic50060a047. 6 (M = Ca, Mg)". Journal of Solid State Chemistry. 115 (2): 447–455. Bibcode:1995JSSCh.115..447J. doi:10.1006/jssc.1995.1158. ↑ Gong, Y.; Zhou, M.; Kaupp, M.; Riedel, S. (2009). "Formation and Characterization of the Iridium Tetroxide Molecule with Iridium in the Oxidation State +VIII". Angewandte Chemie International Edition. 48 (42): 7879–7883. doi:10.1002/anie.200902733. PMID 19593837. ↑ Gulliver, D. J.; Levason, W. (1982). "The chemistry of ruthenium, osmium, rhodium, iridium, palladium and platinum in the higher oxidation states". Coordination Chemistry Reviews. 46: 1–127. doi:10.1016/0010-8545(82)85001-7. ↑ Holleman, A. F.; Wiberg, E.; Wiberg, N. (2001). Inorganic Chemistry (1st ed.). Academic Press. ISBN 978-0-12-352651-9. OCLC 47901436. 5 hydrido complexes". Journal of Alloys and Compounds. 340 (1–2): 180–188. doi:10.1016/S0925-8388(02)00050-6. 1 2 3 4 5 Renner, H.; Schlamp, G.; Kleinwächter, I.; Drost, E.; Lüschow, H. M.; Tews, P.; Panster, P.; Diehl, M.; et al. (2002). "Platinum group metals and compounds". Ullmann's Encyclopedia of Industrial Chemistry. Wiley. doi:10.1002/14356007.a21_075. ISBN 978-3527306732. ↑ Vaska, L.; DiLuzio, J.W. (1961). "Carbonyl and Hydrido-Carbonyl Complexes of Iridium by Reaction with Alcohols. Hydrido Complexes by Reaction with Acid". Journal of the American Chemical Society . 83 (12): 2784–2785. doi:10.1021/ja01473a054. ↑ Crabtree, R. H. (1979). "Iridium compounds in catalysis". Accounts of Chemical Research. 12 (9): 331–337. doi:10.1021/ar50141a005. ↑ Crabtree, R. H. (2005). The Organometallic Chemistry of the Transition Metals (PDF). Wiley. ISBN 978-0471662563. OCLC 224478241. Archived from the original (PDF) on 2012-11-19. 1 2 3 Mager Stellman, J. (1998). "Iridium". Encyclopaedia of Occupational Health and Safety. International Labour Organization. p. 63.19. ISBN 978-92-2-109816-4. OCLC 35279504. ↑ Robinson, R.; Thoennessen, M. (2012). "Discovery of tantalum, rhenium, osmium, and iridium isotopes". Atomic Data and Nuclear Data Tables. 98 (5): 911–932. arXiv: 1109.0526 . doi:10.1016/j.adt.2011.09.003. 1 2 Chereminisoff, N. P. (1990). Handbook of Ceramics and Composites. CRC Press. p. 424. ISBN 978-0-8247-8006-7. ↑ Ogden, J. M. (1976). "The So-Called 'Platinum' Inclusions in Egyptian Goldwork". The Journal of Egyptian Archaeology. 62: 138–144. doi:10.2307/3856354. JSTOR 3856354. ↑ Chaston, J. C. (1980). "The Powder Metallurgy of Platinum" (PDF). Platinum Metals Rev. 24 (21): 70–79. ↑ McDonald, M. (1959). "The Platinum of New Granada: Mining and Metallurgy in the Spanish Colonial Empire". Platinum Metals Review. 3 (4): 140–145. ↑ Juan, J.; de Ulloa, A. (1748). Relación histórica del viage a la América Meridional (in Spanish). 1. p. 606. ↑ Thomson, T. (1831). A System of Chemistry of Inorganic Bodies. Baldwin & Cradock, London; and William Blackwood, Edinburgh. p. 693. 1 2 Griffith, W. P. (2004). "Bicentenary of Four Platinum Group Metals. Part II: Osmium and iridium – events surrounding their discoveries". Platinum Metals Review. 48 (4): 182–189. doi:10.1595/147106704x4844. ↑ Weeks, M. E. (1968). Discovery of the Elements (7th ed.). Journal of Chemical Education. pp. 414–418. ISBN 978-0-8486-8579-9. OCLC 23991202. ↑ Tennant, S. (1804). "On Two Metals, Found in the Black Powder Remaining after the Solution of Platina". Philosophical Transactions of the Royal Society of London. 94: 411–418. doi:10.1098/rstl.1804.0018. JSTOR 107152. ↑ Trigg, G. L. (1995). Landmark Experiments in Twentieth Century Physics. Courier Dover Publications. pp. 179–190. ISBN 978-0-486-28526-9. OCLC 31409781. ↑ Mössbauer, R. L. (1958). "Gammastrahlung in Ir191". Zeitschrift für Physik A (in German). 151 (2): 124–143. Bibcode:1958ZPhy..151..124M. doi:10.1007/BF01344210. ↑ Waller, I. (1964). "The Nobel Prize in Physics 1961: presentation speech". Nobel Lectures, Physics 1942–1962. Elsevier. ↑ Scott, E. R. D.; Wasson, J. T.; Buchwald, V. F. (1973). "The chemical classification of iron meteorites—VII. A reinvestigation of irons with Ge concentrations between 25 and 80 ppm". Geochimica et Cosmochimica Acta. 37 (8): 1957–1983. Bibcode:1973GeCoA..37.1957S. doi:10.1016/0016-7037(73)90151-8. 1 2 "Iridium" (PDF). Human Health Fact Sheet. Argonne National Laboratory. 2005. Archived from the original (PDF) on March 4, 2012. Retrieved 2008-09-20. ↑ Xiao, Z.; Laplante, A. R. (2004). "Characterizing and recovering the platinum group minerals—a review". Minerals Engineering. 17 (9–10): 961–979. doi:10.1016/j.mineng.2004.04.001. ↑ "Irarsite: Mineral information, data and localities". www.mindat.org. ↑ "Iridium: The mineralogy of Iridium". www.mindat.org. ↑ "International Mineralogical Association - Commission on New Minerals, Nomenclature and Classification". nrmima.nrm.se. 1 2 3 4 Seymour, R. J.; O'Farrelly, J. I. (2001). "Platinum-group metals". Kirk Othmer Encyclopedia of Chemical Technology. Wiley. doi:10.1002/0471238961.1612012019052513.a01.pub2. ISBN 978-0471238966. 1 2 Alvarez, L. W.; Alvarez, W.; Asaro, F.; Michel, H. V. (1980). "Extraterrestrial cause for the Cretaceous–Tertiary extinction" (PDF). Science. 208 (4448): 1095–1108. Bibcode:1980Sci...208.1095A. CiteSeerX 10.1.1.126.8496 . doi:10.1126/science.208.4448.1095. PMID 17783054. ↑ Hildebrand, A. R.; Penfield, Glen T.; Kring, David A.; Pilkington, Mark; Zanoguera, Antonio Camargo; Jacobsen, Stein B.; Boynton, William V. (1991). "Chicxulub Crater; a possible Cretaceous/Tertiary boundary impact crater on the Yucatan Peninsula, Mexico". Geology . 19 (9): 867–871. Bibcode:1991Geo....19..867H. doi:10.1130/0091-7613(1991)019<0867:CCAPCT>2.3.CO;2. ↑ Frankel, C. (1999). The End of the Dinosaurs: Chicxulub Crater and Mass Extinctions. Cambridge University Press. ISBN 978-0-521-47447-4. OCLC 40298401. ↑ Ryder, G.; Fastovsky, D. E.; Gartner, S. (1996). The Cretaceous-Tertiary Event and Other Catastrophes in Earth History. Geological Society of America. p. 47. ISBN 978-0-8137-2307-5. ↑ Toutain, J.-P.; Meyer, G. (1989). "Iridium-Bearing Sublimates at a Hot-Spot Volcano (Piton De La Fournaise, Indian Ocean)". Geophysical Research Letters. 16 (12): 1391–1394. Bibcode:1989GeoRL..16.1391T. doi:10.1029/GL016i012p01391. ↑ Gilchrist, Raleigh (1943). "The Platinum Metals". Chemical Reviews. 32 (3): 277–372. doi:10.1021/cr60103a002. ↑ Ohriner, E. K. (2008). "Processing of Iridium and Iridium Alloys". Platinum Metals Review. 52 (3): 186–197. doi:10.1595/147106708X333827. ↑ Hagelüken, C. (2006). "Markets for the catalysts metals platinum, palladium, and rhodium" (PDF). Metall. 60 (1–2): 31–42. Archived from the original (PDF) on March 4, 2009. ↑ "Platinum 2013 Interim Review" (PDF). Platinum Today. Johnson Matthey Plc. Retrieved 2014-01-10. ↑ Jollie, D. (2008). Platinum 2008 (PDF). Johnson Matthey. ISSN 0268-7305 . Retrieved 2008-10-13. ↑ Egorova, R. V.; Korotkov, B. V.; Yaroshchuk, E. G.; Mirkus, K. A.; Dorofeev N. A.; Serkov, A. T. (1979). "Spinnerets for viscose rayon cord yarn". Fibre Chemistry. 10 (4): 377–378. doi:10.1007/BF00543390. ↑ Emsley, J. (2005-01-18). "Iridium" (PDF). Visual Elements Periodic Table. Royal Society of Chemistry. Retrieved 2008-09-17. 1 2 Handley, J. R. (1986). "Increasing Applications for Iridium" (PDF). Platinum Metals Review. 30 (1): 12–13. ↑ Stallforth, H.; Revell, P. A. (2000). Euromat 99. Wiley-VCH. ISBN 978-3-527-30124-9. ↑ Darling, A. S. (1960). "Iridium Platinum Alloys" (PDF). Platinum Metals Review. 4 (l): 18–26. Bibcode:1960Natur.186Q.211.. doi:10.1038/186211a0 . Retrieved 2008-10-13. ↑ Biggs, T.; Taylor, S. S.; van der Lingen, E. (2005). "The Hardening of Platinum Alloys for Potential Jewellery Application". Platinum Metals Review. 49 (1): 2–15. doi:10.1595/147106705X24409. ↑ Crookes, W. (1908). "On the Use of Iridium Crucibles in Chemical Operations". Proceedings of the Royal Society of London. Series A, Containing Papers of a Mathematical and Physical Character. 80 (541): 535–536. Bibcode:1908RSPSA..80..535C. doi:10.1098/rspa.1908.0046. JSTOR 93031. ↑ Cheung, H.; Tanke, R. S.; Torrence, G. P. (2000). "Acetic acid". Ullmann's Encyclopedia of Industrial Chemistry. Wiley. doi:10.1002/14356007.a01_045. ISBN 978-3527306732. ↑ Halmshaw, R. (1954). "The use and scope of Iridium 192 for the radiography of steel". British Journal of Applied Physics. 5 (7): 238–243. Bibcode:1954BJAP....5..238H. doi:10.1088/0508-3443/5/7/302. ↑ Hellier, Chuck (2001). Handbook of Nondestructive Evlaluation. The McGraw-Hill Companies. ISBN 978-0-07-028121-9. ↑ University of Warwick (3 February 2019). "Simply shining light on dinosaur metal compound kills cancer cells". EurekAlert! . Retrieved 3 February 2019. ↑ Zhang, Pingyu; et al. (15 December 2018). "Nucleus‐Targeted Organoiridium–Albumin Conjugate for Photodynamic Cancer Therapy". Angewandte Chemie . doi:10.1002/anie.201813002. ↑ Penzes, W. B. (2001). "Time Line for the Definition of the Meter". National Institute for Standards and Technology. Retrieved 2008-09-16. ↑ Höflinger, Gisela. "Brief Introduction to Coating Technology for Electron Microscopy". Leica Microsystems. Leica Microsystems. Retrieved 22 April 2019. ↑ Abdullah, S. Z.; Bérubé, Pierre R.; Horne, D.J. (2014). "SEM imaging of membranes: Importance of sample preparation and imaging parameters". Journal of Membrane Science . 463: 113–125. doi:10.1016/j.memsci.2014.03.048. ↑ Ziegler, E.; Hignette, O.; Morawe, Ch. ; Tucoulou, R. (2001). "High-efficiency tunable X-ray focusing optics using mirrors and laterally-graded multilayers". Nuclear Instruments and Methods in Physics Research Section A: Accelerators, Spectrometers, Detectors and Associated Equipment. 467–468 (2002): 954–957. Bibcode:2001NIMPA.467..954Z. doi:10.1016/S0168-9002(01)00533-2. ↑ "Face-to-Face with Jerry Johnston, CXC Program Manager & Bob Hahn, Chief Engineer at Optical Coating Laboratories, Inc., Santa Rosa, CA". Harvard-Smithsonian Center for Astrophysics; Chandra X-ray Center. 1995. Retrieved 2008-09-24. ↑ Möhl, D. (1997). "Production of low-energy antiprotons". 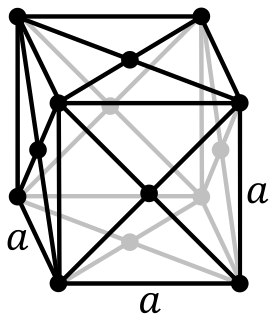 Zeitschrift Hyperfine Interactions. 109 (1–4): 33–41. Bibcode:1997HyInt.109...33M. doi:10.1023/A:1012680728257. 1 2 Janowicz, A. H.; Bergman, R. G. (1982). "Carbon-hydrogen activation in completely saturated hydrocarbons: direct observation of M + R-H → M(R)(H)". Journal of the American Chemical Society. 104 (1): 352–354. doi:10.1021/ja00365a091. 1 2 Hoyano, J. K.; Graham, W. A. G. (1982). "Oxidative addition of the carbon-hydrogen bonds of neopentane and cyclohexane to a photochemically generated iridium(I) complex". Journal of the American Chemical Society. 104 (13): 3723–3725. doi:10.1021/ja00377a032. ↑ Källström, K; Munslow, I; Andersson, P G (2006). "Ir-catalysed asymmetric hydrogenation: Ligands, substrates and mechanism". Chemistry: A European Journal. 12 (12): 3194–3200. doi:10.1002/chem.200500755. PMID 16304642. ↑ Roseblade, S. J.; Pfaltz, A. (2007). "Iridium-catalyzed asymmetric hydrogenation of olefins". Accounts of Chemical Research . 40 (12): 1402–1411. doi:10.1021/ar700113g. PMID 17672517. ↑ Wang, X.; Andersson, M. R.; Thompson, M. E.; Inganäsa, O. (2004). "Electrophosphorescence from substituted poly(thiophene) doped with iridium or platinum complex". Thin Solid Films. 468 (1–2): 226–233. Bibcode:2004TSF...468..226W. doi:10.1016/j.tsf.2004.05.095. ↑ Tonzetich, Zachary J. (2002). "Organic Light Emitting Diodes—Developing Chemicals to Light the Future" (PDF). Journal of Undergraduate Research. Rochester University. 1 (1). Retrieved 2008-10-10. ↑ Holder, E.; Langefeld, B. M. W.; Schubert, U. S. (2005-04-25). "New Trends in the Use of Transition Metal-Ligand Complexes for Applications in Electroluminescent Devices". Advanced Materials. 17 (9): 1109–1121. doi:10.1002/adma.200400284. ↑ Mottishaw, J. (1999). "Notes from the Nib Works—Where's the Iridium?". The PENnant. XIII (2). ↑ Crookes, W., ed. (1867). "The Paris Exhibition". The Chemical News and Journal of Physical Science. XV: 182. ↑ Pepper, J. H. (1861). The Playbook of Metals: Including Personal Narratives of Visits to Coal, Lead, Copper, and Tin Mines, with a Large Number of Interesting Experiments Relating to Alchemy and the Chemistry of the Fifty Metallic Elements. Routledge, Warne, and Routledge. p. 455. ↑ "Radioisotope Brief: Iridium-192 (Ir-192)" (PDF). Radiation Emergencies. Centers for Disease Control and Prevention. 2004-08-18. Retrieved 2008-09-20. Wikimedia Commons has media related to Iridium . Look up iridium in Wiktionary, the free dictionary.